Almost four years after we noted that the fight between German collection society GEMA and YouTube had gone on way too long, it looks like it's finally been settled. If you don't know, way back when, GEMA, which is effectively a mandatory copyright royalty collector in Germany, demanded insane rates for any music streaming on YouTube. Apparently, it initially argued that a stream on YouTube was no different than a purchase on iTunes, and thus it should be paid the same rate. In 2009, it asked for 17 cents per video view (which was a decrease from the 37.5 cents per stream it had asked for earlier). 17 cents. Anyone who knows anything about how the internet works and how advertising works knows that's insane. YouTube was paying out a decent chunk of its advertising revenue to other collection societies at a fraction of a penny per view, which is inline with the potential ad revenue. This created a huge mess in Germany, where tons of YouTube views were blocked -- even when the creators have properly licensed the music. GEMA just threw up a big "no." This is why, when I was in Berlin a few years ago, talking with musicians, one of them showed me how his band had an "official" website that GEMA knew about and an unofficial secret "real" website, where his band could actually distribute its own music, without GEMA interfering. Think about that for a second. GEMA was regularly blocking musicians from doing what they wanted with music so it could try to shake down YouTube/Google for ransom. And it went on until now. Six or seven years ago, Germany was the only major country where the local collection society could not come to an agreement with YouTube and it took until now to finally sort this out. There's no word on the final amount, though I imagine it will come out at some point. GEMA is crowing about the fact that this will cover payments back to 2009, though, since so many videos on YouTube in Germany were blocked from that point onward, think of all the views and all the money that GEMA deliberately blocked users from ever receiving. Either way, the common practice of seeing that a video is "not available" in Germany is now mostly over. There are apparently some videos, for music not represented by GEMA that will remain blocked, but this is a big step forward. For many, many years, the big German music performance rights organization GEMA has been at war with YouTube over what rates YouTube must pay for any streamed music. It started with GEMA more or less arguing that a stream on YouTube was effectively the same as a purchased download on iTunes, and that it should get $0.17 per stream (yes, per stream). For anyone who understands even basic economics you'd recognize that's not even remotely in the realm of reality. The battle has gone on ever since, and unlike basically every other country in the world GEMA has refused to budge. Because of this YouTube has blocked most major label music from its service in Germany, while GEMA has filed a variety of lawsuits against YouTube in the country arguing that YouTube is somehow responsible for what YouTube users upload. On Thursday, the higher regional court of Munich rejected GEMA’s claim for damages to the tune of around €1.6 million ($1.75 million). If you’re wondering, that figure represents royalties for 1,000 music videos chosen as examples, at a rate of 0.375 euro cents per view. The court upheld a judgement by the lower regional court in Munich, which said YouTube is just a host for uploaded video. Meyer also notes that GEMA will likely appeal, so it's not over yet. He also notes, of course, that the rate demanded, while still insane, is at least lower than what GEMA was originally asking for. YouTube and the music collection society GEMA have been at war for many years. Five years ago, I was at Berlin Music Week and it was one of the major points of discussion. YouTube was blocking all music videos, since GEMA insisted that YouTube should pay rates on par with digital sales (iTunes) rates for each play. Musicians I met with in Germany were furious at GEMA's obsessive control over their own music -- with one musician even showing me how he had an official website that GEMA was aware of, and an "unofficial" website his band showed to fans, which offered up free music (something GEMA refused to allow). The various court rulings in the case have been a mixed bag with some finding YouTube liable for user uploads, and even saying that YouTube needs to put in place a keyword filter. German Courts also haven't been too happy with YouTube's custom message for (accurately) explaining why so much music is blocked in Germany. While YouTube and GEMA have tried negotiating a deal (as collection societies in basically every other country have done), in Germany it never seems to happen. While that may appear reasonable at first glance, in practice it's a mess. The only way to even try to do that is to over-aggressively block any and all uses of that particular work -- which will undoubtedly lead to overblocking. Song playing in the background? Blocked. Parody video? Blocked. Algorithm not sure? Blocked. A more detailed ruling is expected in a few weeks, but this seems like a mixed bag. We've had many stories over the years about just how evil and awful the German music collection society GEMA can be. I've been to Germany a few times over the past few years, and have spoken to musicians who tell me horrifying stories about how you basically have to sign up with GEMA, and then GEMA controls what you can do with your music. For example, I met a band that wanted to license its music under a Creative Commons license, but GEMA doesn't like to recognize such licenses. Another band showed me its "official" website, which it told GEMA about, and then its "real" website, which it told its fans about, where the band could actually put up their own music for free. GEMA is basically controlled by the legacy interests and only pays attention to a small group of very successful musicians. Everyone else is left out in the cold. 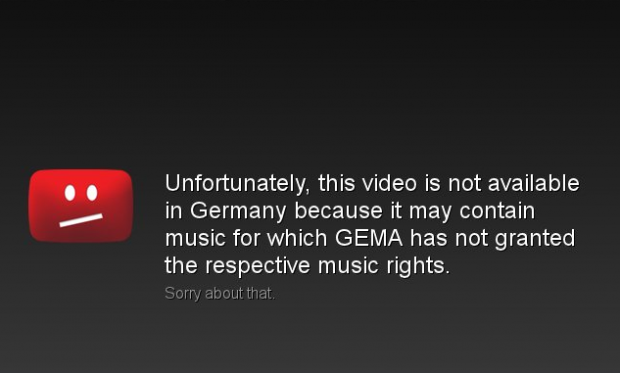 There's a reason why GEMA is the only major collection society that still hasn't worked out a deal with YouTube. Last year we wrote about some folks in Germany who were trying to do something about this, starting a competing collection society that understood that "free" wasn't necessarily a bad thing, and which actually respected its members and the new opportunities presented by the internet, beyond looking at them all as a cash register to shake as much money as possible out of. This organization, called C3S or the Cultural Commons Collecting Society is finally getting off the ground, and wouldn't you know it, they're turning to crowdfunding to make it work. Within a very short period of time, they've raised over €34,000 of the €50,000 target -- though they are really aiming for €200,000. They point out that they're not against traditional licensing at all, but think there's room for a more forward looking organization that recognizes both traditional licensing and more modern options that many musicians want. Furthermore, unlike GEMA, C3S is designed to be open, social and democratic. This should be an interesting project, worth following. We've discussed GEMA's antagonistic attitude towards, well, pretty much everyone other than itself. In addition to turning the German YouTube experience into a farcical collection of "Sorry" faces and demanding fees for music it doesn't even control, GEMA has also been in the news due to its rollout of a "streamlined" fee structure that threatens the existence Germany's underground club scene with unsustainable licensing rates. Luis Manuel Garcia at Resident Advisor has put together a very thorough and excellently written rundown of the recent events, covering GEMA's attempts to "streamline" its licensing fee structure (and its adverse effects) and explaining some of the organization's idiosyncrasies. (This is a very nice word for GEMA's thuggish tactics that go beyond villainy to cartoonish supervillainy.) There are a few differences between GEMA and other performance rights organizations (BMI, ASCAP, PRS, etc.). Much of this has been covered here before at Techdirt, so I'll give you some of the high/low points of GEMA's services, with some added details from Garcia. Rather than being limited to "public performance rights," GEMA handles "collective rights management" for its 64,000 German members and 2,000,000 worldwide members. GEMA still collects licensing fees from businesses but its power goes much, much further than ASCAP's or BMI's. GEMA decides how to distribute your work... and at what price. This means that music-makers don't sign over ownership of their music upon joining GEMA, they sign over their usage rights—the right to legally manage and collect licensing fees for playback, reproduction and broadcast of their music. This is a convenient arrangement when you're a small-time musician who doesn't have the time or money to manage your catalogue; but these management decisions are taken out of your hands. If you want to grant a free license to a charity event or offer a reduced fee for a career-advancing event, you'll find that decision isn't yours to make. All music is assumed to be under GEMA's control unless the artist can prove otherwise. Unlike ASCAP, BMI, PRS, etc., GEMA isn't opt-in. And it's pretty tough to opt out. GEMA tends to "play it safe" by claiming music it doesn't own. Like other PROs, GEMA distributes licensing fees to top-selling artists. This distribution scheme is unlikely to change in the hands of GEMA. Its so-called "full members" (members who have achieved over €30,000 in GEMA revenue over a five-year period) are the only members allowed to vote on issues or hold controlling positions. Any artist not within this elite group has to watch his or her fees being redistributed to already wealthy artists while being prevented from attempting to effect any change in the prevailing structure. GEMA assumes (like other PROs) that every venue plays only music from top-selling artists. For underground music venues that mainly feature non-mainstream and independent artists—like many dance music clubs—this means that a portion of the fees collected for these events will likely find their way into the bank accounts of mainstream artists and advertising jingle writers, whose music was never played during the event, while some artists will never see a single cent for their music, however popular it may be. GEMA splits music into three categories which affect rates collected and royalties paid and arbitrarily decides for the artists what category their music falls under. Unlike other PROS, GEMA is a "for-profit" organization that enjoys a government-granted monopoly and legal powers. Making all of this worse is the fact that GEMA is a private interest "for-profit" organization, unlike most PROs which operate under a "non-profit" status. GEMA also operates as a monopoly, a problem made worse by the German government's decision to grant it legal power to "protect" the rights of its members. For years, the German government seemed to have no problem with GEMA's tactics and monopolistic operation. In fact, its only complaint was directed at GEMA's complex fee structure. GEMA responded to this by streamlining its rates with a clear eye on maximizing income. It was required to negotiate these changes with club owners and other affected parties, but its monopoly position basically turned the discussion into GEMA stating, "Here are your new fees," and walking away from the table. Negotiations broke down sometime in late 2011, however, and an attempt to initiate legal arbitration failed as well. GEMA therefore decided to go ahead without the negotiations or arbitration and published a new tariff structure in the Bundesanzeiger (Federal Gazette) in April 2012, which effectively made the new tariffs legally-binding. Now, the venues being hit hardest were nightclubs, especially underground clubs that catered to non-mainstream crowds and played non-mainstream music. GEMA's "streamlined" fee structure was built from the sort of opportunistic math that could only come from a self-interested monopoly. Any concessions to reality were thrown out the window in search of higher fees. First, GEMA killed off yearly flat rates and replaced them with "per-event" charges. Supposedly, this was to "balance" fees between large and small venue owners. GEMA even claimed this would reduce fees for 60% of its "customers." But once it applied its GEMA-friendly calculations, everyone was guaranteed to see an increase in licensing costs. GEMA calibrated the new rate for dance clubs (Tarif M-V) with the goal of charging approximately 10% of the gross income for a music event. Of course, they don't trust organizers to self-report their revenues accurately, so they estimate the gross income based on venue size and price of entry, and then charge 10% of that. This estimation is based on three assumptions: 1) the capacity of a venue is one person per square-meter, measured wall-to-wall (i.e. beyond the dance floor and ignoring solid objects like furniture); 2) the event is full to capacity; 3) everyone is paying full price for entry. This sort of mathematical assumption would ruin any normal business. Fortunately for GEMA, it's a government-ordained monopoly which exists solely to extract fees. The more it extracts, the healthier it is. Under the old flat-rate structure, a 500 square meter club would have paid around €7,800 annually. Under GEMA's new plan, this leapt to over €78,000. When club owners complained about this exorbitant rate hike, GEMA responded (belatedly) with a nominal attempt at "fairness." In answer to complaints about these distorted results, GEMA later introduced the Angemessenheitsregel (appropriateness rule), which allows promoters to apply for a partial refund if GEMA fees are well over 10% of actual gross income or if the venue's capacity is well under GEMA's one person / m2 ratio. In other words, club owner would still need to pay up front and hope GEMA would cut them a (partial) refund check sometime in the next several months. Seeing as GEMA doesn't trust club owners to honestly self-report revenues (hence the lousy fee structure), it wouldn't be surprising if it decided these refund requests were dishonest as well, and rejected a majority of them. This rate hike hit underground clubs hardest, but GEMA wasn't done punishing them yet. GEMA also levied a rate hike based on the length of the event, jacking the rate up by 50% once the event passed 5 hours and adding another 50% hike every two hours after that. This led to astronomical charges for clubs that routinely ran 10-hour-plus events or operated around the clock. As more outrage poured in, GEMA dialed this back to a 25% increase every two hours after the 8-hour mark -- not as bad, but still unaffordable. Obviously, GEMA felt it still wasn't making enough money from these events, so it decided to start double-dipping by cramming its hands into the DJs' pockets. [I]n late November GEMA announced another tariff, VR-Ö, which became known as the "laptop surcharge." It applied to all music performances that use blank media such as CDs, tapes, USB sticks and hard-drives. This already existed in the past as an automatic 30% surcharge on the entirety of GEMA music licensing fees if any of the DJs used mp3s or burned CDs. Now, the surcharge would no longer be a percentage of the fees, but would instead be calculated at 0.13€ for every mp3 file on the DJ's computer. Every song over five minutes costs an extra 20% per minute. 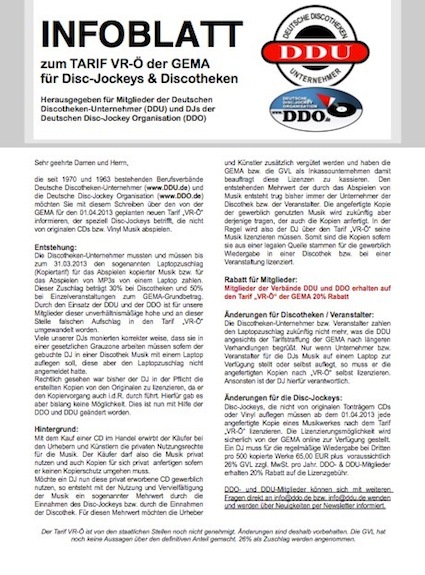 Performers and promoters all over Germany were not pleased, especially since the rate appears to charge all files on a DJ's performing device, regardless of how many songs they actually play. All of this led to protests against GEMA and its club-killing license fees. A petition managed to gather enough signatures to get the government's attention. The German government looked into GEMA's fee structure and its opportunistic club revenue calculations. GEMA reentered negotiations with artists' representation and rolled back its fee structure to its pre-"streamlined" levels. It also adjusted its "laptop surcharge" to a flat rate of 50 euros per 500 songs, making this more affordable for DJs, if not actually any less presumptuous and stupid. (RA says some Germans feel this is nothing more than an opportunity for GEMA to jack the rates later on its newly collected list of registered DJs.) There's also been a call for German legislators to craft policies to regulate GEMA's actions. The outcome of this controversy has been a little better than expected, considering GEMA's horrible track record. Still, as is evidenced by GEMA's ongoing battle with Google/YouTube, the rights organization still has a long way to go before it will be considered anything other than predatory and overbearing. German artists should at least be given the chance to opt out without having to jump through GEMA's hoops. And all rights organizations should start making an honest effort to track actual usage, rather than simply throwing more money at those artists who already have plenty. It's 2013 and the technology exists to make this possible. PROs (and GEMA) are simply being willfully obtuse by pretending they can't do anything better than cut checks while eyeballing the latest Billboard chart. GEMA and MEGA may have the same letters arranged differently, but you have to imagine that the hardline copyright maximalists at GEMA aren't at all pleased by Kim Dotcom's new Mega outfit, even if it's really not all that different than tons of other online cloud storage platforms. Still, it is a bit odd to see that GEMA had Mega's launch video removed from YouTube. There was music in the video, but as Dotcom notes, it was either his own music, or music by musicians who all gave permission to use it. My guess is that it may have more to do with the ongoing dispute between GEMA and YouTube, which means that any video with GEMA content is blocked in Germany. However, Dotcom filed a dispute, and notes that he plans to have his lawyers discuss the matter with GEMA. It looks like the long-running dispute between GEMA, Germany's brutish performance rights organization, and YouTube isn't ending anytime soon. This licensing battle goes back to 2009, when Google's contract with GEMA ended and the German PRO asked for $0.17 per view, a rate Google claimed was "without comparison in the history of online music." (By comparison. YouTube was paying PRS, the UK performance rights group, $0.0034 per view in 2009.) GEMA countered that it had offered to take $0.01 per stream, but wanted YouTube to cough up more usage data in exchange for the cut rate. Once this initial negotiation broke down, things went from frosty to litigious. GEMA went on to sue YouTube in a 2010 test case for distributing copyrighted material without permission — holding it responsible for copyrighted material uploaded by its users. Then in April last year a German court ruled that YouTube must install software filters to prevent users uploading content whose rights GEMA holds. After a couple of lawsuits, GEMA returned to the "negotiating" table, this time with an offer a bit more in line with reality. Die Welt reports that GEMA wants the German Patent and Trademark Office to arbitrate on whether its proposed rate of 0.375 cents per stream is appropriate — but YouTube is arguing for a lower rate. This doesn't really resemble a negotiation at this point. GEMA offers, Google counteroffers and all of a sudden, the home team's PTO is going to decide whether GEMA's preferred rate is "appropriate." But that's not all: GEMA is also suing YouTube to the tune (pun really not intended) of €1.6 million for the alleged unlicensed use of 1,000 songs from its catalog. Not only that, but another German court is in the process of defining YouTube's role on the web, something that could potentially see YouTube remove itself entirely from Germany. A Hamburg court is already arbitrating another row between GEMA and YouTube over how the platform should be defined. GEMA claims that YouTube is a content provider whose business model is built on content that is subject to royalties. YouTube, on the other hand, says it is a hosting service which simply makes space available to its users. The push here is to remove any sort of "safe harbor" (such as it exists in German law) and hold YouTube entirely responsible for anything uploaded by its users. Framing YouTube as a content provider puts it right in the legal crosshairs, which is where GEMA wants it. Despite the efforts made by YouTube to curtail infringement, GEMA still wants to see it pay more. Of course, GEMA's doing this "for the artists." And those artists must be thrilled, what with the world's most popular video streaming site serving up this message, rather than actual videos, all too frequently. And wouldn't you know it, GEMA also has a problem with the message posted by YouTube, which has become visual shorthand for the German YouTube Experience. GEMA is demanding that YouTube take down the on-screen notice blocking music videos in Germany that blames GEMA for the impasse. In November last year, GEMA head Harald Heker accused YouTube of deliberately misleading German users with the notice. "The notice about GEMA is being posted wilfully, purely to stir opinion," he told WirtschaftsWoche magazine at the time. "YouTube is trying to awaken the false impression that the failure to license is GEMA's responsibility. That is simply wrong." YouTube believes that rights holders and artists should benefit from their work. We have dozens of collection society deals in place across more than 45 countries because we provide an important source of income for musicians and a platform where new artists can be discovered and promoted. Music labels are generating hundreds of millions of dollars on YouTube every year. Artists, composers, authors, publishers, and record labels in Germany are missing this opportunity as a result of GEMA’s decisions. We remain committed to finding a solution with GEMA compatible with YouTube’s business model so that we can again provide a source of revenue for musicians and a vibrant platform for music lovers in Germany. That's the crux of the situation. The artists, composers, etc. aren't just missing these opportunities -- they're not even being allowed to have these opportunities, thanks to GEMA's insistence on combative, hardline tactics. GEMA hasn't done much for the artists it "represents," but it's doing a great job turning Germany into a cultural island. GEMA's ongoing efforts to destroy as many music venues as possible in the name of "performance rights" continue unabated. If anything, GEMA's approaching some sort of event horizon in terms of PRO insanity. Recently, GEMA was given permission by the German parliament to assess levy increases of up to 1,400% on some of Germany's most iconic underground clubs, threatening their continued existence. The reason given for granting GEMA its exorbitant requests was, unbelievably, that it was too difficult to assess performance rights fees accurately. GEMA's new "simplified" rates are based purely on the size of the venue and the length of the event -- it has nothing to do with whether or not GEMA represents the artists played. There has been a little pushback on the extra fee assessed to events that run more than five hours -- as they often do in underground clubs -- but GEMA has decided that because it gave an inch, it's fully justified in taking a mile. FACT Magazine brings us the news that GEMA is adding a brand new fee to the mix, bizarrely aimed at DJs who utilize laptops and play MP3s rather than records or CDs. It now appears that GEMA are attempting to knuckle down even harder on club performances. So far this has only – to our knowledge – been reported on German language websites, but at the heart of these newly proposed set of changes is a tax (or “laptop surcharge”) on DJs playing music from laptops, to the tune of 30% for every music file under five minutes with an increase of 20% for each additional minute. What we’re unsure about is whether this only refers to files that are played, or all music on the offending laptop – we’d presume the former, but the post on Tanith implies the latter (“e.g. 10,000 mp3s on the DJ laptop would [require] 1,300 Euros”). The gist of it, as far as can be made out via Chrome translation, is that venues will pay an additional 30% surcharge on top of the already jacked-up fees if the featured artist uses a laptop. This fee can be waived, however, in exchange for a per track levy. According to the Tanithblog, GEMA is charging a "duplication" fee for each MP3. MP3s under five minutes in length are assessed a 13-cent per track fee. Each additional minute brings with it a 20% increase in price. It's unclear at this point whether GEMA is assessing this fee for each track played or each track on the hard drive. Considering its "difficulty" with accurately tracking music played, I would assume GEMA will opt for a levy on the contents of the drive, which will be less "onerous" and result in larger fee assessments. If this new fee is levied only on the tracks actually played, this means GEMA has access to actual tracks used during the event, and therefore should charge only for covered artists. But GEMA won't do that. Instead, it will go for whichever fee is larger and easier to assess. Considering 10,000 tracks is probably "traveling light" for any respected club DJ, a 1,300 Euro assessment is probably on the low end. It's a rigged game, with GEMA selling out the artists it represents by systematically running venues into the ground. This latest fee is another example of its outsized sense of entitlement and zealous pursuit of every possible revenue stream. The audacity of leveraging a new fee simply because of the technology involved has nothing to do with helping its artists and everything to do with cutting itself in on the ongoing migration of DJs to laptop-driven live sets. As some commenters at FACT point out, this sort of per-MP3 fee has already been deployed in Hungary and Poland, so it's not the first time DJs have been charged for the contents of their laptops. Another commenter notes that Hungary's version is a per file fee, so if GEMA follows suit, DJs will be charged for every music file on their hard drive (unplayed or not) along with files on removable drives and burned CDs. There's no indication that the PROs assessing this MP3 surcharge have any interest in determining if the tracks they're collecting on are actually under their purview. In the real world, this is called running a protection racket. Out in the PRO world, it's just business as usual. The petition itself deployed an interesting tactic, targeting the legality of the "GEMA presumption." The petition, which began circulating in August, specifically protested the so-called "GEMA presumption," i.e. GEMA's method of deciding tariffs for clubs and festivals based on the assumption that they own rights to 100% of the music being played there. The reasoning behind this is that it would be too difficult to sort out which tracks were or weren't written by GEMA members. This method is part of what allows GEMA to decide their tariffs based purely on the amount of space in a venue and the duration of its events, without necessarily knowing what music was played. Not much of a "method," is it? It's exactly what the protestors call it: "presumption." Rather than make any attempt to even make a ballpark guess at the percentage of music GEMA might actually be able to collect on, GEMA has bullied its way to a supremely privileged position that allows it to claim tariffs on 100% of any music played in nearly any venue. The duration of the events works against the underground clubs as well, as their extended hours drastically increase the fees GEMA collects. The audacity of this claim (and the unwillingness to do any legwork) is astounding. Whatever hold GEMA has over the government, and by extension, Germany's music consumption, far surpasses the power of other PROs, labels and IP groups around the world. Resident Advisor points out that this isn't the first time GEMA's "presumption" has been challenged. While GEMA could still claim that its artists provide a larger share of the records played in these clubs, it's still a long walk from 65% to 100%, that latter percentage being what determines the fees assessed. Unfortunately, the Bundestag sided with GEMA in this earlier action, stating that any alternative would be "too cumbersome" for the PRO to utilize for its collection efforts. This second concession to GEMA by the Bundestag effectively allows GEMA to set rates with impunity and frees it from having to determine actual music usage. In addition to granting GEMA even more power, it likely dooms several iconic Berlin clubs to extinction, thanks to rate increases that reflect only GEMA's self-serving "streamlining" rather than the actual music played or the clubs' actual income. Organizations like GEMA are supposedly "protecting artists" by imposing these fees. There's some "protection" going on here, but it's got nothing to do with art. GEMA is killing the music industry. Despite needing artists to survive, GEMA seems particularly hellbent on destroying any venue these artists might use to make money in its quest to secure even more money. It takes a certain level of diabolical shortsightedness and greed to "elevate" yourself above the rest of the PROs into "Most Hated" status. Considering other PROs have done such endearing things as shakedown the Girl Scouts and non-profit charities for spare change, GEMA has its work cut out for it. Maybe it's the famous German industriousness that has provided GEMA with the impetus to turn Youtube into a massive collection of "Sorry, this content is not available in your country" messages. Maybe it's some form of corporate sociopathy that has turned it into a self-destructive monster capable of destroying artists' futures in the name of artists' "rights." The latest move by GEMA has sparked protests, a claim that most other PROs can't make. GEMA, in its infinite wisdom greed has decided that the underground music scene just isn't paying its fair share. The fix? Raise rates 1,400% and if a few clubs go under because of the hike, well, that's just part of the price of doing business. GEMA, the organisation responsible for collecting mechanical copyright fees on behalf of some 65,000 artists in Germany, have announced a price hike which could spell the end for some of Berlin's most revered clubs. If the changes go unchallenged, the legendary Berghain - facing a fee hike of 1,400% - will shut after its NYE party this year; the similarly monolithic Watergate is likely to go the same way, claiming its mechanical copyright fees will be increased from €10,000 per year to €200,000. As is par for the course in instances like these, it's all about "fairness" and "putting money in the pockets of artists." But like every other PRO, GEMA exists to collect fees and redistribute them to the artists, starting at the top. Those most heavily represented by chart success, airplay and radio exposure get the largest chunk, with little to nothing reaching those artists operating outside the mainstream (like, say, THE UNDERGROUND), many of whom may not even be registered with GEMA. In the new scheme, commencing 1st January 2013, the complex existing system of eleven different fee structures is being replaced with just two: monthly charges will be calculated as a percentage of ticket price and relative to the size of the venue. There will, however, be a 50% surcharge if events last longer than five hours, and a similar increase after another three hours. Der Spiegel calculates that, "for an average Berlin club with 410 square meters of space, charging €8 entrance and running two events per week from 10 p.m. until 5. a.m, the price paid to GEMA will rise from the current €14,500 to some €95,000 - an increase of 560%". It seems evident that these plans favour venues (such as bars and gig spaces) with shorter opening times, placing a disproportionate financial burden on clubs. Legendary spots like the Berghain, renowned for the kind of marathon all-weekend sessions largely prohibited in the UK due to stricter licensing, will fare the worst. GEMA has it all figured out, though. You can nearly hear the condescending smirk wrapped around this statement by Regional Manager Lorenz Schmid. "The way I see it, [clubs have] been paying far too little in the past. I see no problem for a club manager if he has to pay €1.20 out of €12". Of course you think it's manageable. You're the one collecting the fees. When you're on that end, it all seems like a drop in the bucket. Those on the other side see it differently. It's another unexpected cost to factor in, and when you're running a club that caters to the underground, you don't really enjoy the sort of profit margins that more mainstream events and entities do. GEMA is killing off some of the few outlets for underground artists in order to further reward the top of the heap. Makes sense. Fortunately, the underground scene isn't taking this lying down. The Berlin community isn't taking the change lying down: on 25th June, 5,000 gathered to protest outside GEMA's summer party; on the 30th, more than 2,000 clubs across the country stopped the music for five minutes to raise awareness of the new fees... High profile artists including Alec Empire, Blawan, The Black Dog, Mike Paradinas and Steffi have spoken out against GEMA's plans. The German patent office are apparently investigating the legality of the scheme, but they won't reach a decision before the fees come into effect - which may be too late for many of Berlin's clubs. There is also an online petition, which you can sign here. Given the historical importance of Germany's underground club scene, as well as its contribution to Germany's tourist industry (more than 35% of visitors cite the city's nightlife as a major reason for their visit, according to the Guardian), it would be incredibly disappointing to see it killed off by a rent-seeking agency looking to further reward the top 5% of artists. Maybe this backlash will highlight the stupidity of destroying outlets for artists in the name of "protecting" artists.